Not only are we are animal lovers, through and through, but we care for your furbaby as if they were our own. Not using headphones while walking your furbaby. Keeping phone time to a minimum while with your furbaby. A staff member will come to your home to meet you and your pet for free! This gives everyone the opportunity to get comfortable with one another and discuss your specific needs. Does your furbaby need someone to stop by check on food and water? We’ve got you covered with this quick $10 service. We’ll spend 15 or 30 minutes walking and talking with your furbaby! After all, a tired dog is a happy dog! 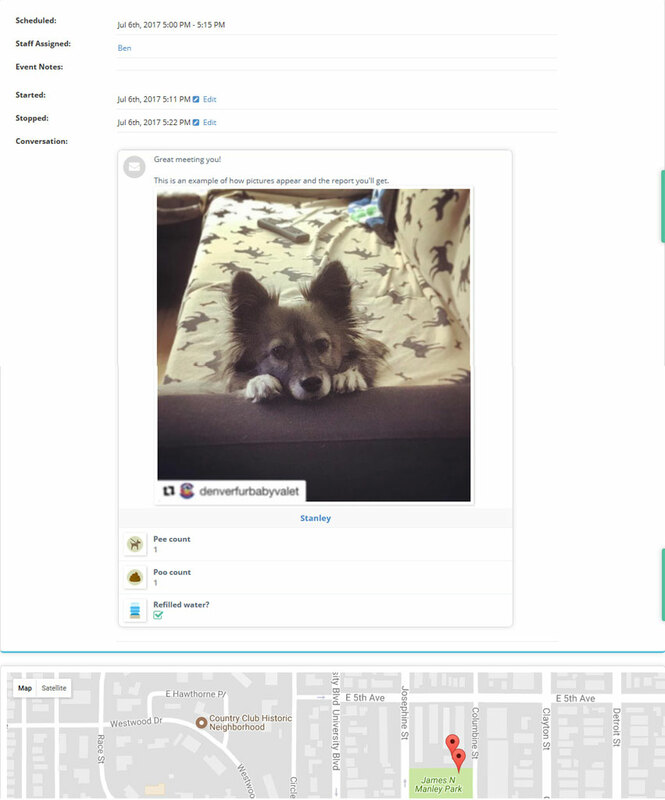 Our GPS tracking feature lets you see where your furbaby went and the accompanying report will show how they did. We give your furbaby our full attention; unless otherwise directed we’ll never take any other dog from a different household with us on our walks. Fresh water and food can be given at the end of the visit. We recognize that our feline friends tend to be happier and more relaxed in their own homes, so cat visits last 15-20 minutes and include cleaning the litter box and surrounding area, giving them fresh food and water, treats, and playtime. Some furbabies really like the adventure of exploring new horizons! If this describes your pet, we have the perfect service for you. Your pet will stay overnight at pet sitter’s and receive one evening walk, fresh food and water, overnight, and a morning walk. Additional fees apply ($10-$15) if you need the sitter to pick up/drop off your pet. We also find that sometimes your furbaby likes to stay at their home, and we most definitely can perform that service as well. Uh Oh! It’s 10 pm and you just realized that you left your keys at your friend’s house. Give us a call and we’ll have you lounging in your PJ’s before you know it. If your furbaby has a hot date with the groomer while you’re at work, we’re here to help! We provide one way and round trip pet taxi service to the veterinarian, groomer, day care, etc. Life can really get hectic at times! So to help you out, a DFV team member will take care of any errands you have. We can pick up dry cleaning, get groceries, go to the post office- just let us know and we’re on it! We will administer medications, water plants, etc. Please note that there is a 12-hour cut off for normal bookings; when available, there will be an $5 surcharge for each visit booked with less than 12 hours notice, as well as weekends and after hours (7pm – 7am). Major holidays (one day before and after New Year’s Eve and Day, Memorial Day, Fourth of July, Labor Day, Thanksgiving, and Christmas Eve and Day) will be assessed a $10 surcharge. If an overnight visit is scheduled, it will be per service over the length of the stay. Click here to schedule or get in touch for more details. We are bonded & insured by Pet Care Insurance.